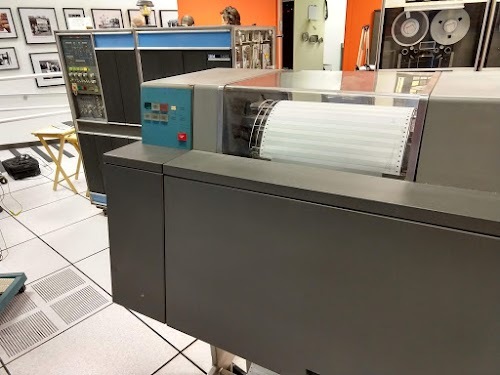 The Computer History Museum has two operational IBM 1401 computers used for demos, but a few weeks ago one computer suddenly couldn't print anything. I helped track down the problem, but it was more tricky than we expected; along the way we had to investigate the printer error checking circuits, the print buffer, and even low level core memory signals. This blog post discusses our investigation and how we traced the problem to a failed germanium transistor. The IBM 1401 mainframe computer (left) at the Computer History Museum printing the Mandelbrot fractal on the 1403 printer (right). The IBM 1401 computer was announced in 1959, and went on to become the best-selling computer of the mid-1960s, with more than 10,000 systems in use. The 1401 leased for $2500 a month (about $20,000 in current dollars), a low price that let even medium-sized businesses use the 1401 for payroll, accounting, invoicing, and many other tasks. The IBM 1401 computer was constructed from small circuit boards (called SMS cards) plugged into units called "gates"—these are gates in the sense of something that swings open, not logic gates. The photo below shows the 1401 with one of the gates open, revealing dozens of brown SMS cards plugged into the gate. 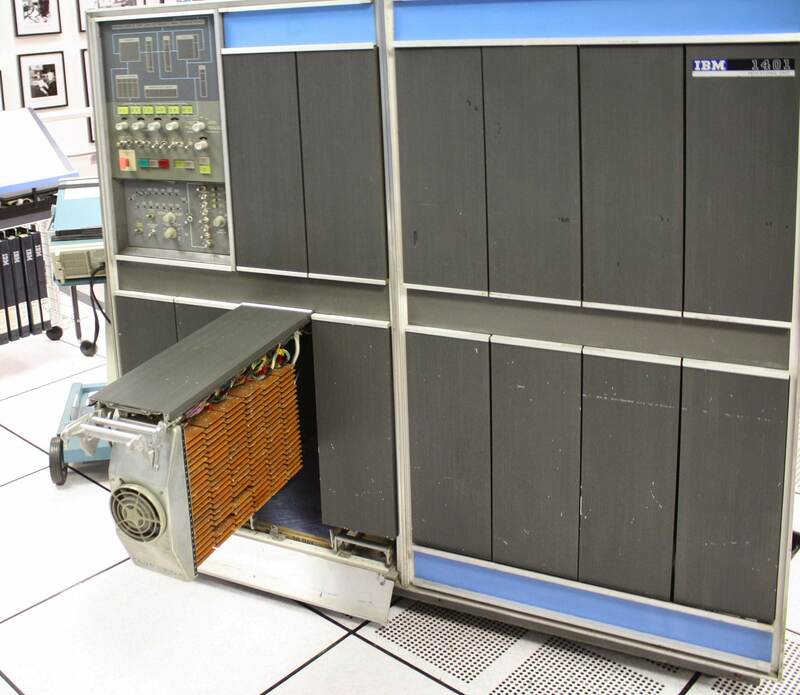 The IBM 1401 computer, with one of the gates opened, showing the dozens of circuit boards (SMS cards) in each gate. The fan on the front of the gate keeps the cards cool. One key selling point of the IBM 1401 was its high-speed line printer (the IBM 1403), which could hammer out 10 lines per second. (IBM claimed this was four times as fast as competing printers, but others dispute this.) The 1403 printer had excellent print quality, said to be the best printing until laser printers were introduced in the 1970s.1 IBM claims that "Even today, it remains the standard of quality for high-speed impact printing." 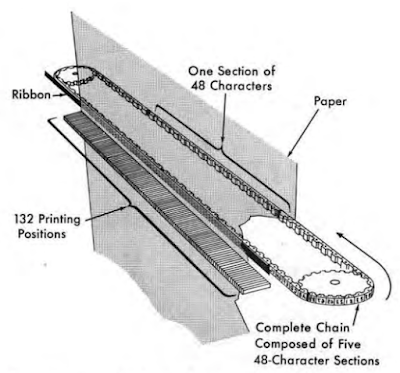 Closeup of the type chain (upside down) for an IBM 1403 line printer. Printing mechanism of the IBM 1401 line printer. From 1401 Reference Manual, p11. Unfortunately, the printer at the Computer History Museum recently had a problem: whenever a line was printed, the computer would halt due to a "print check" error. Fortunately the museum has a team of volunteers to help keep the system running; people helping with this printer problem included Ron Williams, Frank King, Marc Verdiell, Carl Claunch, Michael Marineau, Robert Garner and Alexey Toptygin. By the time I arrived to help, Ron had written a simple test program that repeatedly attempted to print a line; he toggled the program into the computer by hand, and he disabled the error check. The printer printed the characters properly, so we suspected the problem was in the error reporting circuitry inside the computer. Our strategy was to find the error signal and then trace it back through the computer to determine why it was being generated. We started by examining the latch circuit that holds the print check error condition and sends it to the rest of the computer. To find the circuit, we consulted the documentation: binders of cryptic computer-generated wiring diagrams, called Automated Logic Diagrams (ALD). A small piece of an ALD is shown below showing the print check latch (PR CHK LAT). Each box on the ALD corresponds to a circuit on an SMS board and the lines show how the boards are wired together. Deciphering the text inside the box on the right indicates a board of type 2JMX implementing a "2+AO" function, which in modern terms is AND-OR-Invert. The text in each box also indicates the location of the card: its gate (physical swing-out gate, not logic gate), gate 01A6 in this case, and the card's position in the gate (F10). Thus, to check the output (labeled H) of the latch with the oscilloscope, we swung out gate 01A6, found card F10, and hooked the oscilloscope to pin H. We found pin H went low (error) when pins F and G went high, which was the proper behavior for the latch. Pin G (PR CK SAMPLE) was essentially a clock to sample the error state, while pin F was the error signal itself. 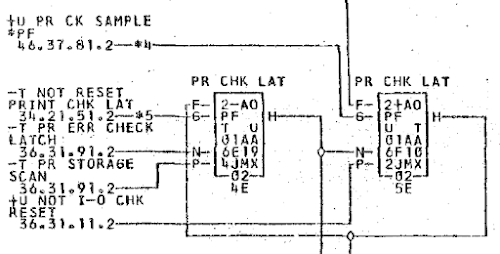 Our next task was to determine what was triggering the error signal on pin F.
Excerpt of an Automated Logic Diagram (ALD) for the IBM 1401, showing the print check latch (PRT CHK LAT). This page is denoted 36.37.21.2. Logic diagram of the error checking logic for the IBM 1401/1403. From Instructional Logic Diagrams page 77 "Print Buffer Controls". Several different conditions can trigger a print check error3 and we thought the "hammer fire" check was a likely candidate. Recall that the printer uses 132 hammers, one per column, to print a line of characters. To make sure the hammers are operating correctly, the computer has two special planes in core memory. (The 1401 contains 4,000 characters of core memory4; each bit of memory is a tiny ferrite ring that is magnetized one way to store a "1" and the other way for a "0". A grid of 4000 cores forms a plane, storing a 1-bit slice of memory. Multiple planes are stacked up to form the storage unit.) Each time the computer decides to fire a hammer, it records this in core memory in the "equal check" plane. 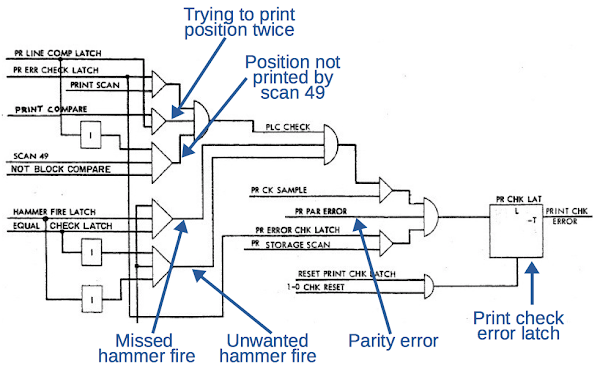 When a hammer actually fires, the current pulse from the electromagnet stores a bit in the "hammer-fire" plane.5 Each print scan cycle, the computer compares the two core planes to see if a hammer was fired when it wasn't supposed to, or if a hammer failed to fire when it should have; a mismatch triggers the "hammer fire" check error. 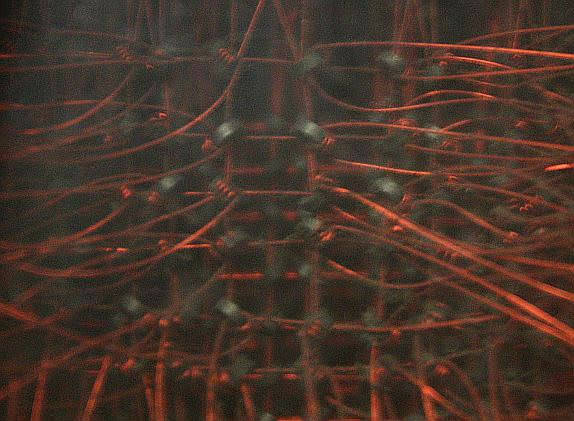 Closeup of the hammer electromagnets in the IBM 1403 printer. An electromagnet (when energized through its pair of wires) pulls a metal armature, which drives the hammer, paper and ribbon against the type slug. There are 132 hammers, one for each column, arranged in two rows of 66. Oscilloscope trace from debugging the IBM 1401's printer. Several things could cause the system to think two characters were being printed in the column. Looking at the printer's output we saw that it printed just the expected character on the paper, so the circuit to print a character seemed to be working correctly (PRINT COMPARE, the single pink pulse above), We tested the blank / unprintable circuit and it was detecting blank and non-blank columns correctly. So the most likely problem was reading a 1 from core memory (the cyan line above, PR LINE COMP LATCH) when it should be a 0. But was the problem the wrong value going in to core, or the wrong value coming out? The logic diagram below shows the circuit that writes to the Print Line Compare core memory. At the right, PR LINE COMP INH is the (inverted) signal written to core.8 On scan 49 (the error-checking print cycle after printing all 48 characters), this line is set high, clearing the memory. If a character is being printed, the PRINT COMPARE EQUAL signal will set the core. At the left, logic gates detect a blank or unprintable character. 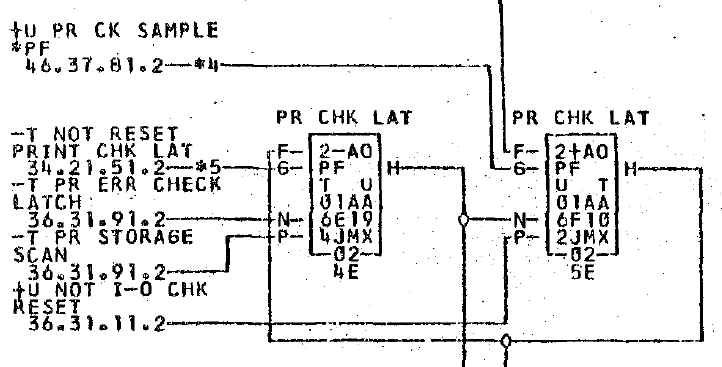 And if a 1 bit was already in core (PR LINE COMP LATCH), the 1 bit is rewritten to core. Logic diagram of the print line complete logic for the IBM 1401/1403. From Instructional Logic Diagrams page 77 "Print Buffer Controls". We detected that this circuit was writing erroneous 1 bits to core because it was reading erroneous 1 bits from core. But that put us in a circle, not knowing if the initial problem was the read or the write. To resolve this, we triggered the oscilloscope on print scan 49, which is when the PLC bits get cleared, and then looked at the next print scan, which reads the cleared bits back. We saw 0's being written (i.e. PR LINE COMP INH high), but unexpectedly saw 1's coming back (PR LINE COMP LATCH). So we knew something was going wrong at a low level in the core memory. I should mention that in the base 1401 system, the printer check bits were stored in the main core memory module, but our system used a separate "print storage" core memory for improved performance. The performance issue is due to how the printer uses core memory: each time a hammer lines up with a type slug, the computer reads the corresponding character from core memory and fires the hammer if the character in storage matches the character under the hammer. Since core memory is constantly in use while printing a line, the computer can't do any computation while printing. 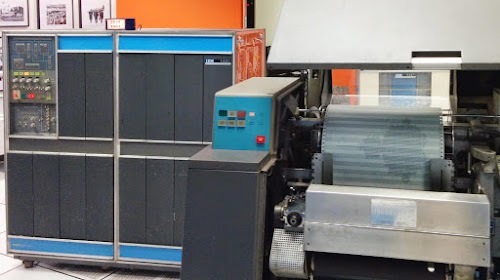 The solution was the print storage feature: an additional 132-address core memory that functioned as a print buffer.7 With print storage, a line to be printed was first rapidly copied from the main core memory to the print storage core memory. Then the computer could continue doing computation using the main core memory while the print circuitry read from the print storage core memory. Each option on the IBM 1401 had a monthly charge; IBM charged an extra $386 a month for the print storage feature. This print storage gate has the circuitry to drive the printer buffer core memory. 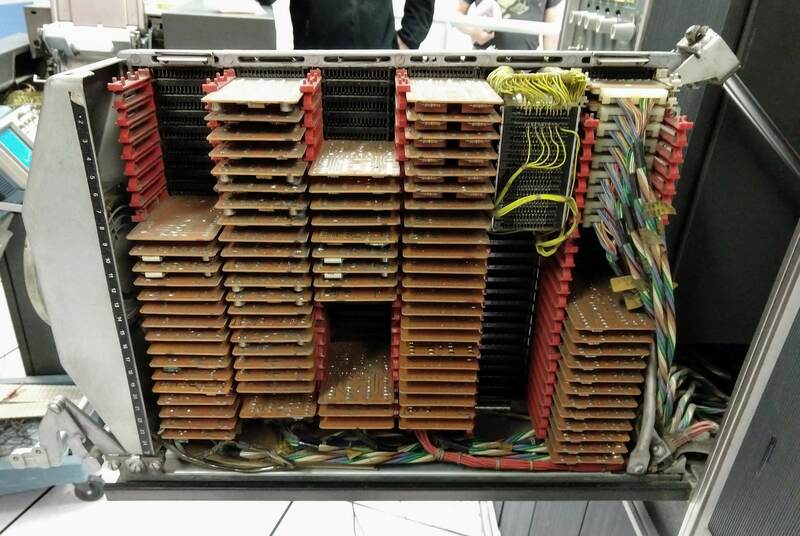 The core memory unit in the upper right has bundles of yellow wires attached. The photo above shows the gate that implements the print storage feature. The core memory module is the block on the upper right with yellow wires attached. (Individual cores can be seen in the photo below.) Core memory requires a lot of supporting circuitry. To select an address, driver cards generate X and Y signals. To write a core, the inhibit signal is combined with the clock by a gate, and then a driver card amplifies the signal and sends it through the inhibit line that passes through all the cores in the plane.8 When a core is read, it induces a pulse on a sense wire. This pulse is amplified by a sense amplifier card, and then the bit is stored in a latch. The numerous SMS cards in the print storage gate provided these support functions. The cores inside the print buffer. The wiring is not the usual core memory grid because each printer hammer is wired directly to a hammer check core. The image quality is bad because of the plastic cover over the cores. We probed the sense amplifier and latch cards on the reading side of the core memory and they seemed to be operating correctly, so we moved to the writing side. The HN inhibit driver card seemed a candidate for failure since it operates at high current, but we swapped the card with a replacement and the printer still failed. Next, I tried looking at the input to that card, but found there was no signal on that line, which seemed very suspicious. 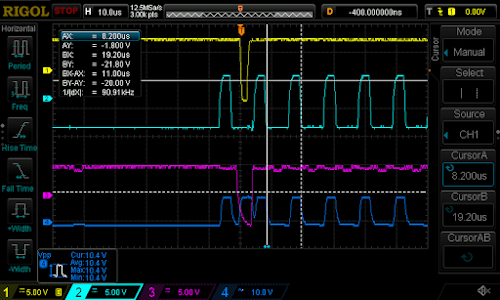 Oscilloscope of the bad "CHWW" NAND gate card: pink (3) and blue (4) are inputs, cyan (2) is the output, stuck high. The missing signal was generated by a card of type CHWW, a NAND gate that combines the inhibit signal with the clock before sending it to the driver card. 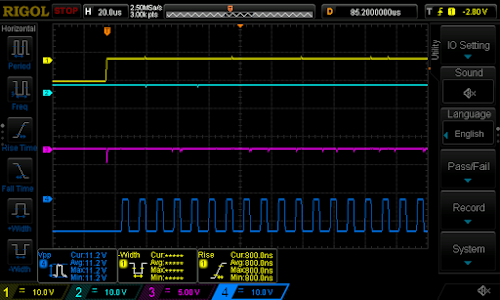 I hooked up the oscilloscope to the inputs and output of the NAND gate, yielding the trace above. This trace was the smoking gun: the output (cyan 2) remained high even when the two inputs (pink 3 and blue 4) went high. This showed that the NAND gate had failed and its output was stuck high. This explained everything: with this output stuck high, only 1's would be written to the PLC core plane. 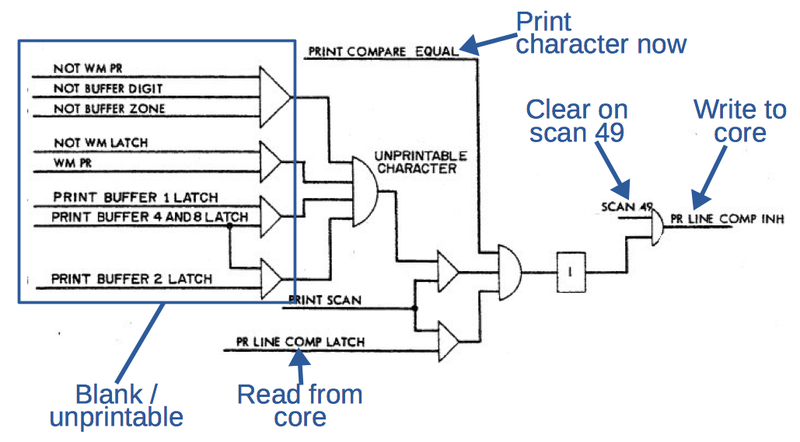 Then, when a character was printed, the print circuitry would read the 1 from core, think a character had already been printed in this column, the PLC check would fail, and the print check error would be triggered. The printer successfully operating, printing out powers of 2. We swapped this card with a spare, and the printer started printing without any errors (above). This proved that we had finally traced the problem; it was a simple NAND gate in the depths of the printer buffer core memory circuit. The failed card is shown below. It implements three NAND gates (details) using diode-transistor logic (which IBM calls CDTL—Complemented Transistor Diode Logic). Each two-input gate uses one germanium transistor (circular metal can) and two diodes (striped glass components on the right). Pull up resistors (striped) and inductors (beige) on the left complete the circuits. The failed CHWW card from the IBM 1401. This card implements three NAND gates. The lower left transistor failed, and has been replaced. I tested the card with a signal generator and found that while two of the three NAND gates worked, the other was stuck at a high output, confirming what we saw inside the 1401. 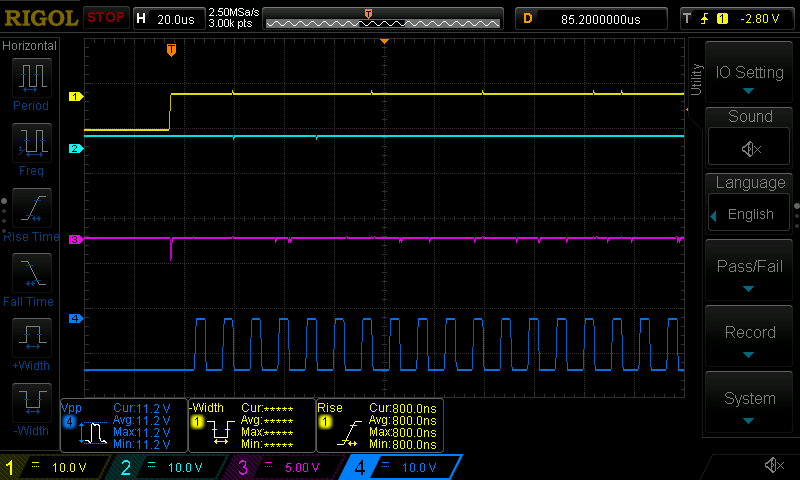 Next I tested the transistors using the diode test mode on a multimeter. The good transistors had voltage drops of 0.23V. (This may seem low, but remember that these are germanium transistors not silicon transistors.) 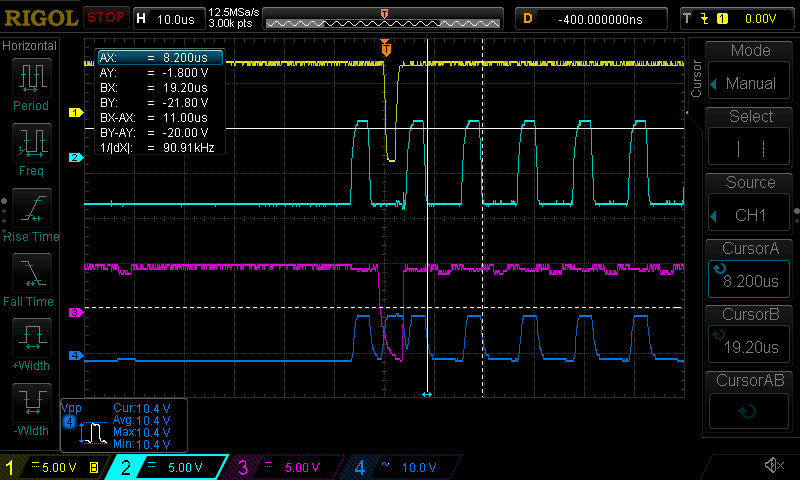 In comparison, the bad transistor had a Vbe drop of 0.95V, much higher. Finally, we removed the transistors and checked them on a vintage Tektronix 577 curve tracer. We thought the bad transistor might just be too weak to operate the gate, but it was entirely dead—totally flatlined on the curve tracer. We opened up the transistor on a lathe and looked inside. The transistor is an IBM 083 NPN germanium alloy transistor (germanium was used before silicon transistors). The transistor consists of a tiny germanium die (the shiny metallic square below), forming the base. Two wires are attached for the emitter and collector, connected to dots of tin alloy, a larger dot on the front for the collector and a smaller dot on the back for the emitter. Under the microscope, it looked like there was some corrosion on the alloy dots and the emitter wire didn't look solidly connected, so we suspect that is the root cause of the failure. 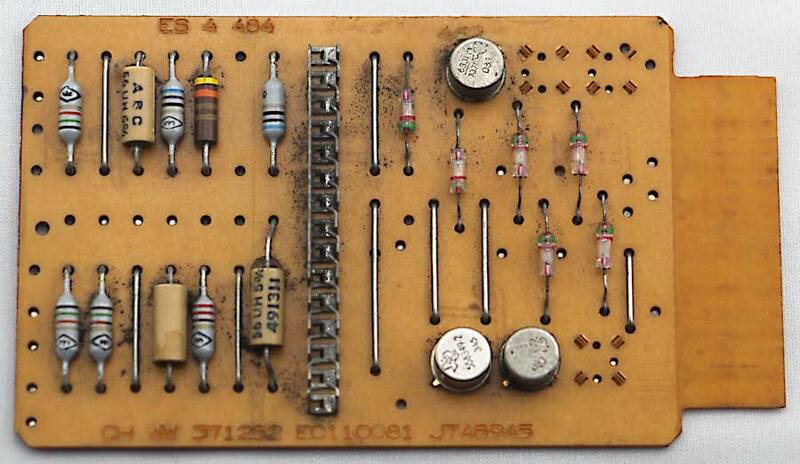 Inside a failed IBM 083 germanium transistor. The silver-colored square in the middle is the germanium die, wired to the base pin. 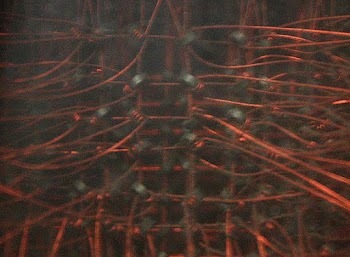 The dot in the middle is tin alloy, forming the collector, with a wire to the collector pin on the left. 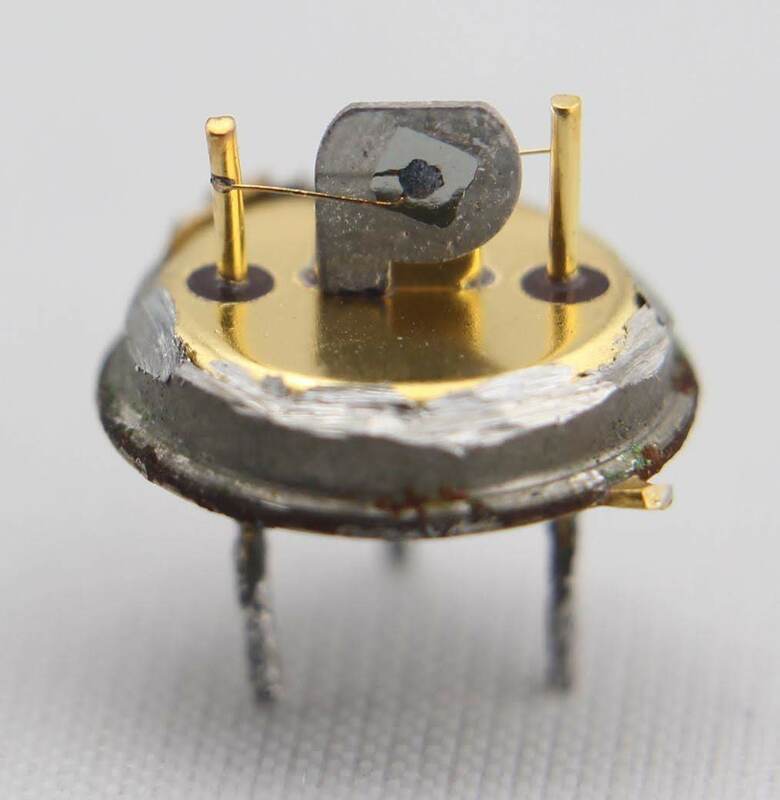 A smaller dot on the other side of the germanium die forms the emitter, wired to the pin on the right. This was a harder problem to diagnose than most of the IBM 1401 issues. But we managed to track down the problem, replace the bad card, and get the printer back in operation. 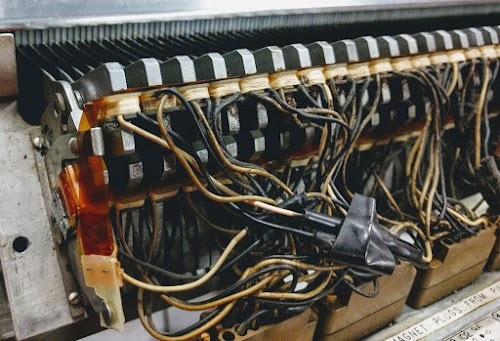 One nice thing about the IBM 1401 compared to modern systems is that it's not a black box—you can look inside all the circuitry, down to the individual transistors. In this case, we were able to find the bad transistor that was causing the system failure, and even determine that it was probably corrosion that killed the transistor. I announce my latest blog posts on Twitter, so follow me at @kenshirriff for future articles. I also have an RSS feed. The Computer History Museum in Mountain View runs demonstrations of the IBM 1401 on Wednesdays and Saturdays so if you're in the area you should definitely check it out (schedule). The mechanism of scans and subscans may seem excessively complicated. But what it accomplishes is matching up the fast "electronic world" with the slower "mechanical world." Specifically, every 11.1 microseconds, a hammer and type slug line up. The computer reads the character in that column from core, compares it to the character on the type slug, and if they match, it fires the hammer. The important thing here is that a core memory cycle matches the time between hammer alignments, making it possible to read the character from core for each hammer alignment. If you want more information on how the print chain works, I have an animation here. It is so amazing to see how stuff was done at the beginning of electronic computation -- each bit, each gate was precious! (and it could be poked with your finger) I keep that in mind when I launch yet another scientific computation on 12000 cores. You are doing great work! This was a very enjoyable article to read, better than some mystery novels! You used a nice modern storage scope. How much harder would this be with an analog scope? Is that what field service used? Regarding note 2 and the page with animation: The mechanism of scans and subscans not only matches electronic world to mechanical world, but also prevents things like someone like me trying to print a magic line of text the would fire every hammer at the same time, which would surely draw too much current or put too much drag on the system, and blow it up. Instead it spreads out the electrical and mechanical load, and thwarts such attempts. Brilliant! I'm convinced all of these ideas will be needed again when we move to nanotech. Dithermaster: back in the 1960s, field service had analog scopes. It was easier with a modern scope (in particular, 4 channels made it much easier to figure out what was going on), but I'm sure they did fine with analog scopes. Wow! A blast from the past. I learned computer maintenance using a Xerox Sigma 2 computer back in the 1970s. The computer was used in a Westinghouse Prodac-250 at a power station. I remember spending hours and hours wading through logic diagrams in large books to troubleshoot the computer. This sure brought back some of those (now fondly remembered) memories. I was the systems programmer for a real mainframe the 7040 scientific computer back in 1965. It used a 1401 as it's card/reader/punch and printer. A little bit of commercial accounting was also run on the 1401. The 1410 which was a machine somewhat similar to the 1401 was more of a commercial main frame. It's absolutely fascinating that this machine verified hammer actuation of the particular character being printed. That's an incredible level of fault checking. I worked on fault tolerant computers where a dual core system was really two sets of three CPUs running in lockstep and having hardware check each bus cycle for disagreement. The memory and storage system were ECC protected, as were network communications, but that level of protection certainly was not extended to laser printers! I also appreciate the fact that these vintage machines can be diagnosed and repaired with fairly available parts - even if you had to steal discrete components from spare cards. Microgadgethacker: don't worry, we ended up fixing the bad card with a replacement transistor. So we didn't cannibalize any of the spare cards. Excellent reading! Thanks for the article. Solid State components should be very very expensive in the 60s but the cost of non-working hours for such machines should be far higher. Then I think that IBM maintenance people carried a bunch of spare cards on their toolboxes, and the troubleshooting was performed by replacing suspect cards while tracking the problem along with the ALD schematics. The cards identified as faulty could be serviced later at the factory using test sets for each model of card. Today you don't have spare cards, then using a 4 channel digital storage scope is totally fair ! Danjovic: I asked some old IBM engineers and they said engineers generally wouldn't have many spare cards (if any) due to the large number of different card types and the high cost of keeping a large inventory. Instead, engineers would usually call the nearest branch office and have someone bring the cards they needed. They would drive halfway and meet up with the person delivering the cards. If the branch office didn't have the parts, they would be sent from the area-level parts depot. For very unusual parts (e.g. a new core array), parts would be flown out from the parts depot in Mechinsburg. Apparently they'd buy two tickets: one for the person delivering the core array and a second seat for the core. I've met a couple people who claimed to have encountered a case where a student figured out the character order on a chain printer and sent the 'magic string'. The described result was having to replace the chain and that they were finding links behind various things for over a year. When I first started working for IBM in the late '70's we used a 1401 with a homemade fixture to program EPROMs. I believe they were Intel 1701's and 1702A's...256 bytes of storage. And it took upwards of 45 minutes to program, if I remember correctly. My thought would be that it uses a counter that resets when it has counted all printable characters. But your animation shows that it would need to count up by 3, instead of the simpler counting by 1. So then I thought that they would re-arrange the order of the characters on the chain, to enable counting by 1. The chain would contain something like A . . B . . C (with some other characters in between, to be used in the next 2 subscans). But speaking against this is the photo you show of the chain, which seems in normal order. The only other thing I can think of is that they renumbered their characters in a different order than the print chain. But that would surely be really impractical in software. What is the solution here? I'm very curious. The first counter is the PSS (Print SubScan) Ring counter, which counts the three subscans in a scan. It is synchronized with the print chain via a magnetic sensor in the printer. Next, the PSS Counter keeps track of the first character in the subscan. It counts through the 48 characters (1 through 12 with two zone bits). Its counting is a bit unusual: it increments after the first and second subscans and decrements after the third subscan, so each scan is one character later. E.g. A, B, C for the first scan, then down to B, C, D for the next scan. The Compare Counter keeps track of the current character on the chain. It loads the value from the PSS Counter at the start of the subscan and then counts by 2. If there is no print buffer, and characters are printed from core memory: the B address register (B star) points to the character in core memory. It is incremented by 3 via the ALU each step. With a print buffer, the memory addressing is entirely different since it uses the print buffer's separate core. The units ring counter goes from 0 to 9 and the tens ring counter goes from 0 to 13. These signals go directly to the X and Y select lines for the buffer core memory. The ring counters increment by 3, which is not too hard with a ring counter. Schematics for the print circuitry is in the Instructional Logic Diagrams starting at sheet 70. A detailed explanation is in 1401 Instruction Logic pages 88-94. I'm pretty sure I used one of these printers (at Rutherford Lab in the UK) in the late 1980's - if not exactly the same model certainly the same family. And boy was it LOUD. The speed of scrolling blank lines or form feeds was impressive. I had no idea it was so old. Excellent diagnosis of a fairly difficult problem (would have been a real challenge if the problem would have been intermittent). I am really impressed the way you have researched the print buffer logic mostly by reverse engineering. I really wish I was there with you to work on this problem. Like always, your posts are really enlightening. All these printers are really old printer. For repairing all these printers you need the Printer technical support and to get the printing images. A printer should be fixed if that is not working. Because of this an important material. We daily use a printer in our daily life. We can print important documents by this printer. Or we can also make a banner by the Digital Printing machine. So a printer should be fixed when it's not working.